RBTH presents a selection of views from leading Russian media on international events, featuring a preview of the upcoming elections to the Ukrainian parliament and how Ukraine has raised the stakes ahead of an expected meeting between the Russian and Ukrainian presidents in Milan. Russian daily Kommersant reported that Ukrainian President Petro Poroshenko has signed into law a bill allowing local self-government in the eastern Ukrainian regions of Donetsk and Lugansk. 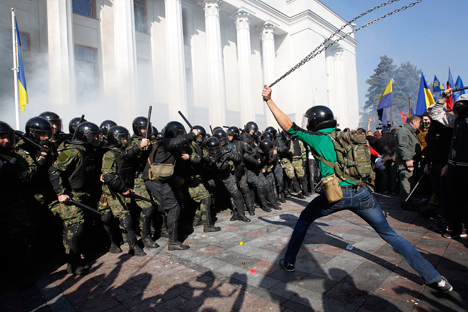 The bill was passed by the Verkhovna Rada, Ukraine's parliament, a month ago. The Ukrainian parliament approved the bill in its entirety, without making any amendments. Among other things, the document states that Ukrainian legislation will be in effect in the regions “given the particularities determined by the present law," and that the right to linguistic self-determination will be guaranteed. Representatives of the self-proclaimed Donetsk People's Republic called the signing of the law “a step in the right direction, because at least Kiev admitted the existence of the problem." However, the Donetsk government added that it "does not intend to follow the new law," according to the newspaper. The newspaper Nezavisimaya Gazeta reported on the chances of Ukraine’s various political parties in the run-up to elections to the Verkhovna Rada. A month ago, polls indicated that between three and five parties could be represented in the next session of the Rada. Today, that number has increased to six. Citing the latest polls, Nezavisimaya Gazeta reported that Anatoly Gritsenko's Civic Position Party is no longer expected to do well in the elections, but the Opposition Bloc, headed by Minister of Energy Yury Boiko, is gaining momentum. President Petro Poroshenko's Bloc is currently expected to do well, followed by Oleh Lyashko's Radical Party and the National Front Party, supported by Prime Minister Arseny Yatsenyuk and Verkhovna Rada Speaker Oleksandr Turchynov. Former Prime Minister Yulia Timoshenko's Batkivshschyna Party is currently trailing. Nezavisimaya Gazeta writes that, according to experts, the number of seats won by opposition parties could be higher than expected, as the general population is growing more disillusioned with the current government. Alexei Antipovich, director of the Rating Center polling agency, told the newspaper that citizens sympathize more with those candidates who can be relied on to solve urgent problems. According to Antipovich, the National Front Party and the Opposition Bloc fit in this category. The opposition parties have promised that the Verkhovna Rada will create jobs, cancel the pension reform, increase social standards and establish dialogue with the pro-autonomy groups in the Donbass. Although some voters associate the Opposition Bloc with Moscow, experts think that the existence of a strong opposition party is vital to the creation of a strong political system in Ukraine. "Without control from a real opposition the government can turn into something like that team whose activities led to the uprising in Ukraine a year ago," reported the paper. Ukraine will hold parliamentary elections on Oct. 26. Expert magazine presented a curtain-raiser on the summit between European and Asian leaders in Milan. Expert reported that on the eve of the summit, Kiev decided to raise the stakes on gas. Ukrainian Prime Minister Arseny Yatsenyuk has refused to guarantee security and continuity for Russian transit gas to Europe, instead demanding that Moscow review the gas contract and sign a new transit agreement – this time with European partners. In response, Russian President Vladimir Putin outlined the consequences of such behavior for Europe and Ukraine. "If we see that our Ukrainian partners illegally start siphoning off gas from our export pipeline system, we will decrease supply in proportion to the thefts," Putin said, according to Expert. The magazine notes that theoretically, even with a complete cessation of gas supply through Ukraine, EU countries would be able to make it through the winter by distributing available fuel among themselves. However, the fact that Ukraine is compromising EU's interests for the sake of pressuring Russia demonstrates that Kiev is becoming an unpredictable partner not only for Moscow, but also for Brussels, Expert concludes.